MB contemplates the grocery store aisle. You can figure out a lot about the flavor profiles of a country by visiting a grocery store. Even though I have lived in France for over a year I am still noticing some of these little differences. For instance, when I first moved here I was annoyed – neigh – horrified by how difficult it was to find a non-sweet cereal that wasn’t corn flakes (MB’s cereal of choice is basically a chopped up candy bar with a handful of granola thrown towards its general direction) but until about two weeks ago I hadn’t noticed the chocolate bars. Over a year’s worth of going to the grocery store and staring dumb-founded at the endless varieties of chocolate filled, chocolate-covered, chocolate cluster cereals and never once had I noticed that there was an entire aisle devoted entirely to chocolate bars; not candy, not cookies, not any other variety of sweets; just an aisle of different brands and combinations of chocolate. It is impressive…and it is awesome. After I noticed this aisle of happiness I started thinking…I mean, come on, just how many combinations of chocolate bars can you need? It’s over the top! And then, I remember the cracker aisle in United States grocery stores. While the French devote large portions of their grocery store to bulk chocolate and other sweet things (there is also an entire aisle just for yogurt) in the U.S. we tend to run more salty. We have an entire aisle of crackers…how many variety of crackers does one need? And don’t even get me started on the chip aisle. There are other subtle differences as well: in U.S. there will be about 10 different varieties of peanut butter, in France you will be lucky to find one, but there will be a variety of Nutella-type spreads available. Recently, we had some French friends over for dinner and I had made oreo cookie truffles (don’t judge me, they are amazing). One of them took a bite and looked at me, pleasantly surprised; clearly he wasn’t expecting an American to be able to make a tasty truffle. “This is very good, it is so interesting! What is it?” He said, holding the truffle aloft. “Oh, just a little something I whipped up,” I said smiling. WHAT?! I didn’t need him to know that it was just Oreos and cream cheese; I was basking in the glow of French praise, it is rare thing, one must savor it! I never thought I would ever hear a French person discuss the complexity of American faire such as peanut butter and jelly sandwiches but when you think about it, it makes sense. A peanut butter and jelly sandwich would be a unique flavor profile in a country where they like their sweet to be sweet. I mean, sure, don’t get me wrong, we all know Americans consume plenty of sugar (let’s check our diabetes rates, people) but we have a tendency to throw a little salt in there: chocolate covered pretzels, buckeyes (http://www.joyofbaking.com/candy/PeanutButterBalls.html), cheddar cheese on apple pie! In France you get things that are sugar on sugar, like my favorite pastry, the Success (and what a success it is, har har har) which is some sort of magical combination of chocolate, coconut, and more chocolate. No peanut butter or salt here! So from my grocery store research I have concluded that we Americans are salty dogs and the French are chocolate frogs. Now if only I could figure out a way to get a whole aisle of crackers AND a whole aisle of chocolate bars at the same grocery store! A little summer homework: What differences have you noticed at grocery stores in other countries? Look forward to reading some fun answers! Queue photos of a woman carrying a grocery bag that breaks, a man having a car splash water on him, a couple having the doors to a theater shut in their face. Show image of unattractive depressed person looking out a window on a rainy day. The word “HOPE” flashes across the screen. “Follow me through this infomercial as we tell you more about this exciting side of living overseas. We’ll explain how everything that happens to you while in another country is actually just the result of that country and not your personal actions. Do you remember that cold you got last winter? That cold was your fault for drunkenly making out with a stranger in January (*The bottom of the screen scrolls “get checked for meningitis”). But I guarantee that if you come with me on this journey, you will learn that any cold you get overseas is not the fault of your own stupidity, but instead, the fault of your host-country for having weird virus strains. If your grocery bags breaks; it is because that country has crappy grocery bags and not because you overloaded it. If a car splashes you with water, it is because the people in your host-country are jerks; it is never just an unfortunate accident. Don’t stay trapped living in a world where bad luck and bad days just happen at random, instead, live in a world where you have something to blame. Show sun peeking through clouds as people waving different flags dance together in a field. Scroll at bottom of screen: DISCLAIMER: We are not responsible for any individuals assaulted, arrested, or kicked out of their host countries. Every once in a while, I will go through a phase of blaming everything that is wrong in my life on France. If I have had a bad day or if someone is mean to me it isn’t just random coincidence; it is the nefarious nature of France. It’s a sort of expat trick that no one ever really talks about. Basically, you can glamorize your home country and decide that all misfortunes that befall you are based directly on the culture, government, and personality of your host-country as opposed to just dumb luck or your own poor behavior and choices. It’s fantastic; really…except for the fact that you are completely ignoring personal responsibility and setting up your home country to disappoint you hugely (no big deal, right?). Luckily, I only go through these phases occasionally. More often, I take it the other approach which is that it is all personal. This is the tack that I take when I have decided that missing the tram, getting yelled out by a professor, and burning dinner is actually a passive aggressive message from France telling me to get the hell out as opposed to just a series of randomly unfortunate events. I mean, it must all mean something, right? It isn’t just coincidence; France is plotting my demise. …Right. It’s personal not business. It is one of the weird things about being an expat – that you can blame bad luck on your host country or that you can decide that your host country is trying to push you out instead of being forced to embrace problems head-on and realistically. It’s really just an extension of the “grass is always greener” idea, the lie that the “other” is the better. The reality is that bad days and bad luck can happen anywhere and it doesn’t matter whether it is in the place you were born, a place you’ve visited once, or a place that you have lived for a few years. Bad luck isn’t a place’s fault at all; it is just coincidence and a consequence of existence in our Universe…so for now we have to deal with it. Though, I have no doubt that once a new Universe is discovered and people move there they will blame that one for everything and think that this one is perfect. I wave trying to get France’s attention. France: Ah, bonjour. It is the Américaine. Me: Yes, it is the Américaine. Why do you say that like you don’t know who I am? France lights a cigarette and shrugs. Me: So, Happy Fourth of July!! France: Ah oui, your independence. Why do I care about this? This is not my holiday. Take your Américain enthusiasm somewhere else, huh? It fatigues me. I put my arm around France’s shoulders and keep walking. France looks at my arm as though it were a poisonous snake. France: Why are you touching me? I do not eenjoy thees. Me: Well get over it buddy, I’ve allowed about a million strangers to kiss my face over the past 16 months and that hasn’t made me comfortable either. France: Such brutes, you Américains. To kiss someone’s face is polite, gentile not like this horrible hugging business. Why do I want your fat body pressed up against me? (France shivers) Grotesque! Me: What?! I’m not even fat. France: Yes, but you are Américain so you might as well be fat. I can’t help it; I hear the accent and this is what I see. France: Pfff…this is what you will never understand, little Miss America, I don’t care what you see when you hear my accent. Me: You’re impossible. I don’t know why I keep trying to talk to you. France: Because I am fascinating. Me: Irritating as well. I’m just trying to celebrate my Independence Day and you have to bring me down. I mean, you know that the French helped us significantly during the American Revolution. You supported us. France gives me an eye roll. France: Ouais. It was a long time ago, non? Me: Yes, but you know even in WWI, we honored Lafayette who helped during the American Revolution. There was even a Lafayette Squadron. France: Typical Américain, so overly sentimental. Wasn’t he declared a traitor later? I seem to remember that. Me: UGH! YOU exhaust ME! I start to walk off. France says this loudly to stop me. France: I am finally interested and you walk away. This time I roll my eyes. France: So, what are you going to do for this holiday? Talk too loudly and wear tennis shoes everywhere? France casually lights a cigarette and sniggers. Me: Haven’t decided yet, what are you going to do for Bastille Day? Feign boredom and wear scarfs in summer? There is a momentary stand-off and then France nods. France: Bien joué. You are learning. Me: I think we will probably have a party for the fourth. You know, lots of food and decorations, patriotic music; I’ll probably wear red, white, and blue. France: Ouais, sounds like you, everything has to be over-the-top and too much. Why do you need to decorate your houses all the time? I don’t understand this. Me: Oh please, like you aren’t going to be running around screaming the Marseillaise and waving the Tricolore next week! France: I most certainly will not! Me: Do I need to bring up photos from last year? France: What? No! I don’t know what you are talking about…I am France, I don’t act like that. You are the reedeeculous ones. I give France a smirk. France: Fine. Maybe we decorate a little, certainly not like you tacky Americans. France: So, I am invited to this fête? Me: I didn’t think you would want to come. France looks everywhere but at me. Me: Oh France, you know you are invited. France: Well, I should think so. France: Pff…always the same. You know we did help you to win, without us there would be no Etats-Unis, huh? France: So yes, I will be there, I will bring some good cheese, something French that will actually taste nice, you know, for Lafayette and all that. Standing in line at the Musée D’Orsay with my Mother who is visiting. We are about thirty minutes back from the front of the queue. An old lady has recently shoved past us in line and we are watching in disbelief as she speedily makes her way through the five or six rows of people in front of us. Mom: This is too good to be true! Me: No way she is going to pull this off. Mom: I think she is. Look at her go! Me: Wow – see how she stops every once in a while, all innocent-like, the whole thing is so premeditated! Really, she’s quite impressive. Mom: I bet she makes it all the way to the front. For a moment I wonder about the morality of betting on an old person as though they were a race horse. Me: I will totally take that bet! Someone is definitely going to bust her; I mean, we can’t be the only ones seeing this! She makes it to the front in mere minutes. My Mother is ecstatic. This is said with serious conviction. Mom: I just knew she was one of those! My Mother is referring to a particular breed of French old ladies who don’t believe that rules apply to them. On her recent trip to France, she became fascinated with this species after an incident at a pay toll. “You see that look that MB is making,” I ask my Mother. We are sitting in the car while he is waiting to pay our parking fee. “Why?” My Mother is confused. “How does that work,” she asks. “Reediculous!” MB has just gotten back in the car. “Yeah, I know, it was great,” I respond. MB gives me a look. This is a cultural phenomenon that I have watched with much amusement during my time in France. Often I find myself waiting patiently in line only to be unceremoniously skipped by an old lady who just steps right in front of me as though it were the most normal thing in the world. No acknowledgement, no sweet old-lady smiles, just ruthless ambition. Some people get annoyed by this (*cough cough*…MB) and often I will catch the glimpse of an irritated eye roll from another patron but most people just stand around like it is not awkward at all. “Am I the only one seeing this,” I think as I look around to find another person who finds it is amusing. To me, it is hysterical, I love that no one dares to ever say a word to them even though they are inwardly fuming, and frankly, I just love the sheer audacity of these women. High five, girl! No? You’re French you don’t ‘high five’, oh and you are pretending I don’t exist anyway. Okay, well congratulations on your badassery! I mean really, what’s not to love? They are the beatniks of the elderly world, cruising by you oh-so-coolly, never speaking but always daring “what are you gonna do about it?” So, I applaud you French-old-lady-line-skippers, I applaud you and your chutzpah*. In her most recent post, Chickster from Up, Up, and Awayz (http://www.upupandawayz.com/2012/05/its-awards-season.html) awarded me with the Liebster Award. Thanks so much, Chickster! The Liebster Award is for blogs with under 200 followers and has no standing rules; but she has asked that I follow the guidelines from the Versatile Blogger Award and post 7 things about myself. So, I’m going to post the 7 things that I find most entertaining about being an expat. 7. Bon Voyage! Over the last four years I’ve spent a lot of time on airplanes and in airports. While this certainly has its disadvantages (see #4) there are also certain benefits to being a constant international traveler. For one thing, I do it really well, I know exactly what to expect on long flights and I am always prepared; my on board carry-on bag has been perfected, I know exactly what I will need to be wearing in order to be comfortable on a plane for 12+ hours (don’t wear jeans, NEVER wear jeans), I am aware of what my entertainment options are on board…sometimes I plan it. Okay, so I will watch Dirty Dancing and then Pretty Woman. Second of all, I know airports. For instance, I know that if I have a really long layover at the Amsterdam airport that they have spas that I can use (seriously, this is one of the best things ever, what better way to spend a five hour layover than getting a massage and facial). I know that if I am flying internationally out of Los Angeles that I will want to eat ahead of time because the international terminal is tiny – there are like three places to buy food and last time I paid 12 (that’s right, 12) dollars for a turkey sandwich that was totally average. This may sound silly, but seriously, knowing what lies ahead on long journeys can go a long way in making them more comfortable. 6. The Timbuktu Clause. Another thing that entertains me about being an expat is that a lot of your friends and family back home don’t really know where you live. For instance, when I lived in New Zealand, if any natural disaster happened anywhere in the ring of fire, I would immediately get emails from people asking if I was okay. There could be a typhoon in Fiji and people would want to make sure we still had electricity. Here in France, everyone just assumes that I live in Paris. It doesn’t seem to matter how many times I explain that I live in Grenoble, people still ask me about my fabulous life in Paris. 5. This is not real. You remember that night five years ago when you got completely wasted with all your friends and your boss and you decided to streak through the neighborhood? Great if you do, but no one else will because they weren’t there. One of the great things about being an expat is that embarrassing stories from your past don’t haunt you in your current life. This also means that you can convince yourself that your new embarrassing stories won’t haunt you in your future life (this is particularly helpful if you do not know how long you will be staying in the country). Did you embarrass yourself in front of someone you were interested in? Did you mess up and get a horrible reprimand at work? Did you split your pants open at a restaurant? None of this matters because as an expat you can just shrug and tell yourself that it isn’t real life, this isn’t really where you live, right? It is one of the most brilliant (and untrue) expat rationalizations. 4. Travel Traumas. Now you may be wondering why I would find traumatic traveling situations entertaining, and while they are happening they are not. However, afterwards, they usually make for hilarious stories and you get to wear your survival like a badge of honor. When MB had to bribe a security officer to be allowed to leave Chad it was scary but afterwards it made for a great story and totally upped his street cred (that’s right, my fiancé how to bribe corrupt government officials, what can your fiancé do?). When I left my passport on a bus bench and missed my flight to the Philippines it was decidedly un-funny, as crying at the airport usually is (https://breadispain.wordpress.com/2011/06/21/jamais-deux-sans-trois/). How does someone forget their passport on a bus bench, you ask? A valid question. I was using it to fan myself because it was hot outside and I didn’t want my makeup to melt off. That’s right, I ended up losing the single most important travel document that any person in the world has for the sake of my vanity. Proud moment? Not really…but damn funny story later. 3. Party favor. Another great thing about living the expat life is that you always have plenty of interesting small talk. An expat never has to have that awkward conversation at dinner parties when you get stuck talking to someone with whom you have nothing in common. DEAR GOD. We have all been there and it is awful. As an expat, you never have to endure this. If you are at a party overseas, people will be curious to know how your experience has been in their country and how you are liking it; and if you are back in your home country people will be curious to know what it was like living overseas. Never again will you have to feign interest in a golfing story. 1. Cool looking passport. There is really not much else to say. It is a vain, self-congratulatory sort of thing but it is true. I LOVE having a full passport, I love flipping through it and seeing all the stamps of the places I’ve been to; it drums up a lot of great memories and stories but it also makes me feel unbelievably cool, I shamefacedly admit it. And there you have it, the top 7 things that I find entertaining about being an expat! Can Bacon be a Vegetable? “Quoi?” MB is amused but not sure why. “Really, first trimester?” I raise an eyebrow at the little belly that MB has developed. His jaw drops in mock horror. For the first four months of the year, MB and I had eight visitors stay with us. While this was a whole lot of fun it also means that we did a whole lot of eating. For each new visitor we had particular cheeses, restaurants, or regional specialties for them to try, and in effect, for us to try. Normally, MB and I go out to dinner once a week; but with the onslaught of visitors, we were having “special occasion” meals almost every single night. There is no amount of exercise that can burn off daily three-course dinners so naturally, he and I both put on a few pounds. At first it wasn’t so bad, the clothes were a little tight, MB started to get a wee belly but after month three things had gotten out of hand. I was starting to have trouble figuring out where my chin ended and my neck began. So, for the past month, MB and I have been dieting which has been an interesting experience. Dieting in France is both easy and complicated. 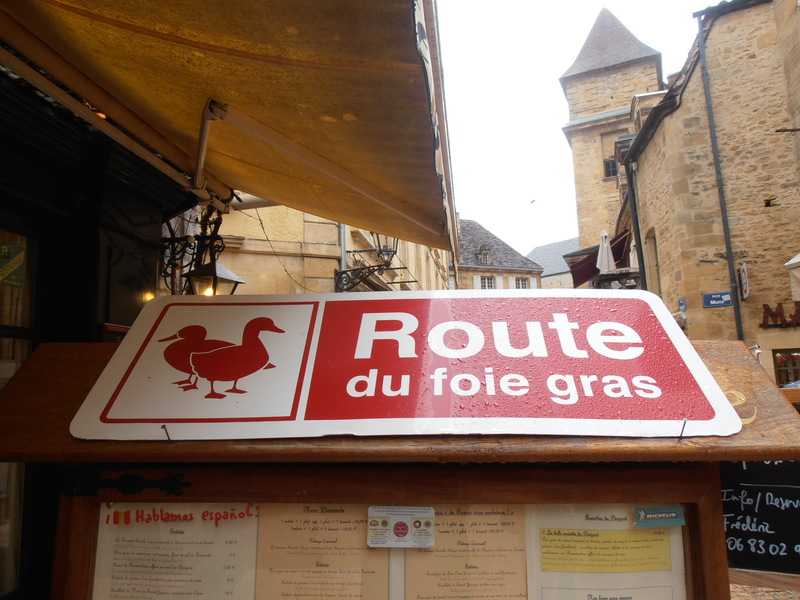 On the one hand, it was easy to cut massive amounts of fat out of our diet by doing things like not having foie gras and duck confit every day (crazy, I know, but it works). On the other hand, deciding that you are going to diet in France and try to avoid high fat cuisine basically means that you are eating at home. 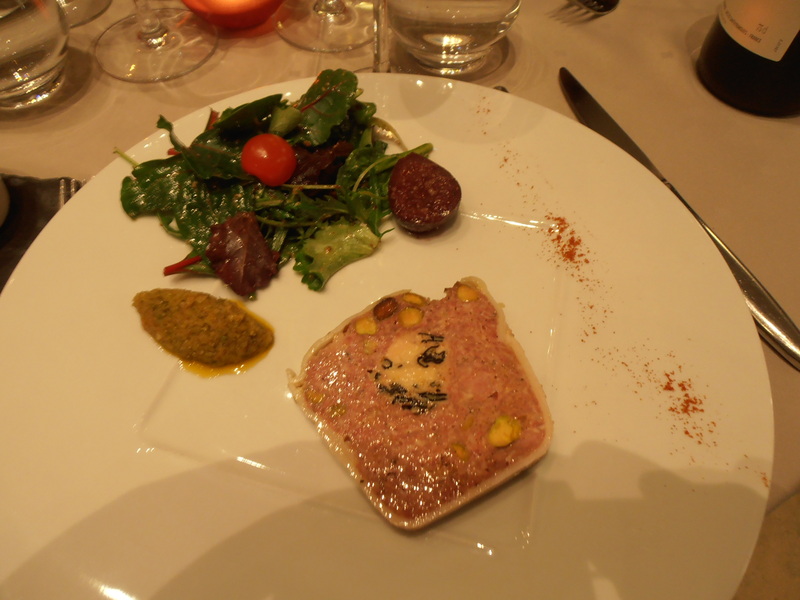 At the French restaurants in our town there are almost no low-fat options. You want a salad? That is great, it will come with lardons, goat cheese, possibly an egg (or my favorite salad which comes with magret canard, gesiers, and foie gras). You want to get the fish? Excellent, monsieur. That will be accompanied with a cream sauce. I remember one of our visitors telling me that she just wanted to have a light meal at the restaurant that evening. She decided to take the salmon…which came with a cream sauce. She asked the waiter what the vegetable option was. It was potatoes Sardalaise. That would be, potatoes cooked in garlic and duck fat. Enjoy your “light” dinner. Note the category of “legumes” on the left-hand bottom. So basically, in France, I think it has to be all or nothing. If you want to diet, or go on a “régime” (even the French word for diet sounds malevolent) then you better make your own food at home because you are not going to find diet food at a restaurant. Although, note that even at home you must be vigilant. 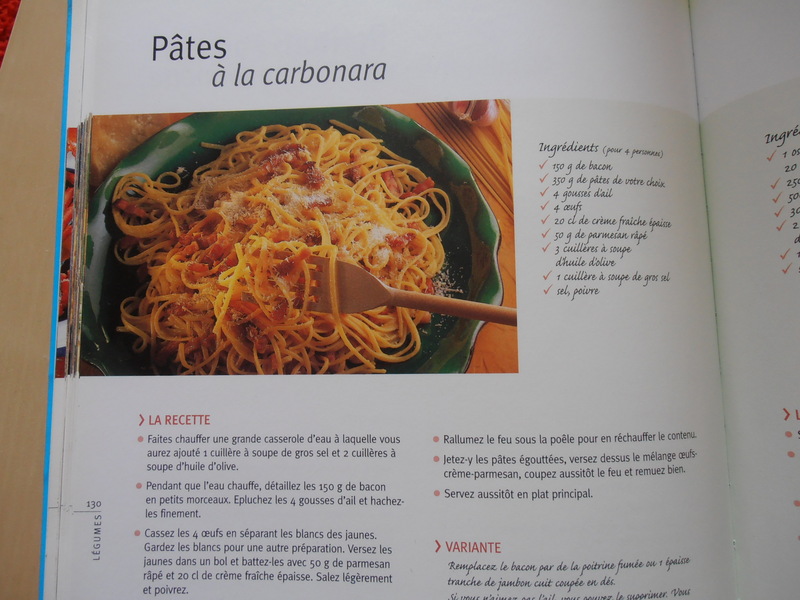 In one of MB’s French cookbooks pasta carbonara is listed under “legumes” (vegetables). I mean, come on! So, at the end of the day, dieting in France takes a huge amount of self-control, a lot of dinners at home, and not believing the cookbooks when they tell you that a crème fraîche and bacon salad is a vegetable. The French are not big on rules. The other night, a friend of ours asked if we could drive him to Ikea; some of the wooden slats on his couch had broken and he wanted to see if he could buy replacements. We suggested that he call first to make sure that the slats he needed were available for purchase. “So, what did they say when you called,” I asked him. Welcome to France, a place where the employee of a company will advise you to pick a fight with his coworkers in order to get what you want. Now, that is what I call customer service! This is a normal type of attitude in France. Rules are considered sort of loose guidelines that you can choose to follow or not. On the streets, cars will be parked in all manner of fashions, in different directions, on sidewalks, sometimes the little cars will pull in perpendicular to a parking spot so that front of the car is on the sidewalk and the back of the car is on the street. My entire neighborhood parks in the spots on the street which are blocked off for fire hydrants. I remember leaving a bar with a friend one night and upon arrival at his car he found he had a ticket. He was outraged. “Why did he get a ticket,” I asked MB. “Did you see the way he was parked,” MB responded. I looked at the car and realized that he had basically just stopped in the middle of a road and left it there. This attitude extends to all variety of things. Crosswalks: just a suggestion, lines: if you feel like waiting, ashtrays: if you can find one. I have no idea how to deal with this. What can I say? I’m a rule follower. I wait in long lines, if someone tells me that they don’t sell an item then I take that as the answer, and if I get a fine for doing something wrong I accept that. I’m terrified to try to break the rules. The French, on the other hand, appear to take a sort of glee in “getting away with it”. MB always looks so satisfied with himself if he has managed to bend a rule without getting caught. One of my first interactions with a French person was about ten years ago at a French restaurant in New York City. The proprietor, who is Parisian, was there and my friends and I happened in on a quiet night. He sat with us and chatted for a bit at the beginning of our meal. Towards the end of the meal, one friend and I went out front to smoke a cigarette; the cigarette ban had just recently passed in New York City. As we were walking to the door, he approached us. We followed him up the back stairs and into a private dining room towards the rear of the restaurant. He pulled out a tea saucer and we all sat. I wasn’t sure what to do. “I’m sorry, should I just ash on the plate?” I didn’t want to be rude or break a rule. My friend and I told this story for ages. It was so classic and so perfectly French.